We care more about your credit future than your credit past. Residential Group offers a No Money Down – No Down Payment loan program that allows buyers to purchase a home for about the same out of pocket costs as moving into a rental. The combination of today’s low Interest rates and great home prices make mortgage payments affordable. Try this loan program before you try an FHA loan because it can save you $100’s in mortgage insurance payments you pay each month. 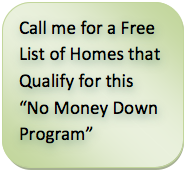 Qualify in 15 minutes Call Today!